Before a dozen bishops and 200 priests and deacons, Auxiliary Bishop Shelton Fabre of New Orleans was ordained yesterday at its Cathedral-Basilica of St Louis. In a moving tie to the past, the Crescent City's third African-American auxiliary was invested with the pastoral staff that once belonged to Archbishop Joseph Rummel, who gave the civil rights movement its firmest ecclesiastical stamp when, in 1962, he excommunicated three leading opponents of his plan to integrate the archdiocese's Catholic schools. Hughes said he has no doubts that Fabre, the son of a bricklayer, is up to the task. Fabre replaced Bishop Dominic Carmon, who is retiring at 76. Carmon has been an auxiliary bishop since 1992. Fabre will start his new duties today. He will be helping Hughes administer the archdiocese, and when an event requires the presence of a bishop and Hughes cannot be there, Fabre can take over such duties. He also can ordain priests and deacons. In addition to serving as auxiliary bishop, Fabre will be pastor of Our Lady of the Holy Rosary Church in New Orleans. Fabre received three rounds of thunderous applause at St. Louis Cathedral in Jackson Square: first after he was newly ordained and welcomed by his fellow bishops into the College of Bishops, then when he walked down the center and side aisles of the cathedral before the ceremony concluded, and finally after he addressed the congregation for the first time as auxiliary bishop. In Wednesday’s ordination program, Fabre wrote fondly of his former diocese. “My years in the Diocese of Baton Rouge will live in my memory, and you will always be in my prayers. Thank you for in so many ways being home for me to this point in my life,’’ he said. Note to whoever picked "Christ is Made the Sure Foundation" to close the opening liturgy of the November Meeting in Baltimore: congrats, you've started a national trend. Or, as the three of you who keep an eye on this stuff would put it, it's the new "O God, Beyond All Praising." For the third time since the US hierarchy returned to the restored Basilica of the Assumption in mid-November, the gem of the venerable English hymnbook is being used at an episcopal event. 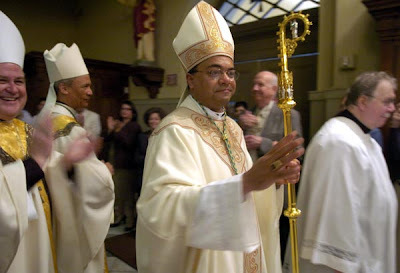 Within weeks of Baltimore, it closed Bishop Daniel Flores' ordination in Detroit, and now (according to preliminary plans) will be the sending-forth of Bishop George Murry's installation in Youngstown on the 28th. With Fabre's ordination and Murry's installation, for the first time, back-to-back events on the circuit will inaugurate the new ministries of African-American prelates. Clearly, the nuncio's November meeting with the black bishops -- where Sambi wowed 'em, just as he's been wowing everyone else over his year in the States -- has borne expedited first-fruits. Some other big bits are in motion as well..... Scrambling for confirmation; stay tuned. Oh, and see you in Youngstown at month's end.